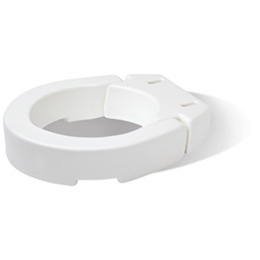 The Carex Hinged Toilet Seat Riser is ideal for easy cleaning. Fits most standard round toilet seats adding 3.5" of height making it easier for individuals with mobility difficulties to sit & stand. Installs quickly and safety between your toilet bowl and existing seat. Product Dimensions: 3.5" x 13.75" x 17.25"